On November 20, 1925, J.E. Bentley Sr. and Ida Carson were blessed with their fifth child and third son. They named him Johnnie Jr. and reared him in Reynolds, Taylor County, Georgia. He received his basic education in the Taylor County School System, and graduated from the Reynolds High and Industrial School in 1944. His home environment was conductive to his spiritual growth at every junction in life, and he had joined White Hill Baptist Church much earlier, in 1938. Following his high school graduation, he enrolled in the Atlanta School of Mortuary Science, and graduated in 1947 as a Licensed Funeral Director and Embalmer. He returned to Reynolds, and joined his father and brother, the late Mr. Anderson Bentley, Sr., in the operation of the family funeral business for the next twelve years. In July 1958, he made his departure from the home front, and ventured into Upson County (Thomaston) Georgia. There, with the support of God and his people, he established his own funeral business, which has grown continually for the past forty one years. Following divine guidance, he transferred his Christian letter to the greater Mt. 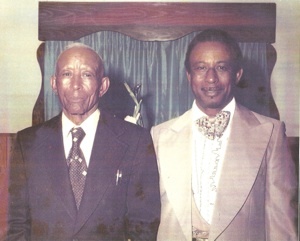 Zion Baptist Church of Thomaston in 1971, where he has served as Chairman and Secretary of the Deacon Board. Other benevolent affiliations, which are consistent to his character, have opened many doors for minority and Afro-American groups in his practice area, mainly the Upson County Men and Women of Action Club, NAACP, Second Flint River Baptist Association, Mutual Aid Society, Inc. and other civil organizations. He has been influential in bringing about justice and equal rights among his people by helping to establish voting precincts that are convenient to many in his area. During the mid eighties, he filed an action suit against the City and County Governments of Upson County to end racial discrimination in promotion and firing practices, which resulted in some employees receiving substantial back pay. In 1988, he followed in his father’s footsteps by branching out. Bentley and Sons Funeral Home of Barnesville, Georgia was established in August. And Bentley and Sons Funeral Home of Woodbury, Georgia was established in January of 2006. He honored his father throughout his lifetime, and adopted the same philosophy: “Yesterdays’s gone, Tomorrow’s unborn; So, all I need to do is live for today, and trust in God to show me the way”. For the past fifteen years, he has been the team leader in serving approximately 350 or more plates of food to the less fortunate in his area during the Thanksgiving season. He is sincerely loved and respected by his family, staff, business associates and many dear, loyal friends for having that human touch in this world that counts. His family includes his beloved wife, Gertrude; four sons, J.W. (Pamela), Paul (Murrie), Kenneth (Candi), and J.J. (Shalonnia).